This first one is SMC Designs Taunt Noir. They have it in the store, but it’s not on the website. In fact, the only place I found it was on the Fabricut website, and it says that it’s discontinued, so it may not be available anymore. But that’s okay because it wasn’t one of my favorites. It was just the first one I found, and it gave me hope that there might be other fabrics out there with the right colors. The colors are great, but I’m not sold on the design. The style looks a bit cutesy, and those curlicue designs on the leaves are a bit over the top for my taste. This one is called Tropix Millbrook Onyx, and it’s one of my favorites. I like that the design is a bit more realistic and not cutesy like the previous one. All that they had was the small swatch above, which really doesn’t give an idea of what the full pattern looks like, so I found this picture on the Joann website. Hmmm…that’s one of those patterns that’s great in small doses, but in full repeats, it looks really busy. But with the vertical repeat at 18 inches, and the horizontal repeat at 27 inches, there wouldn’t be more than one full repeat of the pattern, plus a little extra, showing on each chair. So it would look quite different from the 6+ repeats showing in the picture above. Right now, this one is my favorite, but it doesn’t have any black in it. That’s not necessarily a deal breaker, though. It’s called Richloom Studio Anamarie Aspen. I like that it has the watercolor look to it, without being super abstract like the original fabric I was going to use. And while it’s artsy, it’s not over-the-top cutesy. I also think that the style of the flowers and leaves complements the style of the wall mural (that will be on the opposite side of the room) more than any of these other florals. Next up is Richloom Studio St. Moritz Red Tribal. The colors in this fabric are perfect, but there’s something about it that looks harsh to me, though. But in smaller doses (i.e., used on one section of two upholstered chairs), it might look a bit tamer. 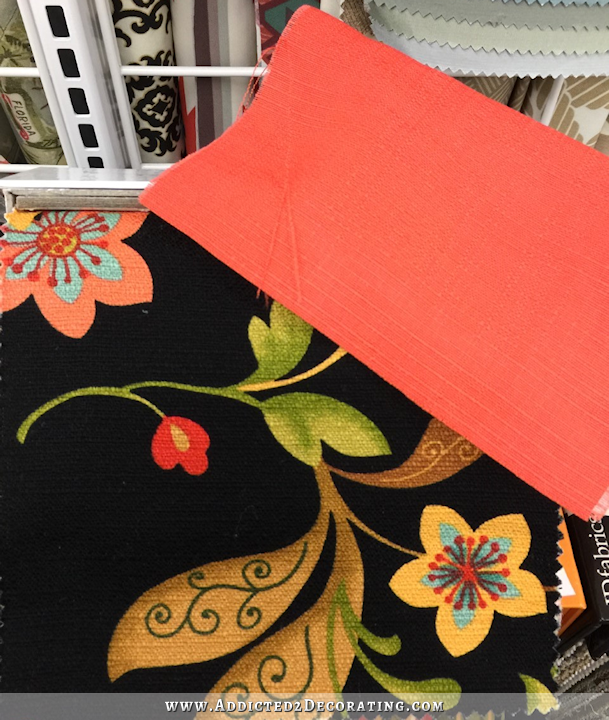 The next one is called Swavelle Mill Creek Venezia Cliffside Noir, and while the colors are perfect, the style of the flowers reminds me of the fabrics that I was originally considering for this room that really didn’t work out. And finally, this is the one and only fabric that I found that had coral and green (no black), and that wasn’t a floral! It’s called SMC Designs Faust Candy. Unfortunately, I can’t find this one on the Joann Fabric website either, so it might be discontinued as well. So the good news is that there are definitely quite a few fabrics out there that have the right colors in them. The bad news (so far) is that none of them are quite what I’m looking for. I kind of had my heart set on a small or medium-sized geometric pattern of some kind since floral fabrics might look really busy with my wall mural, and my draperies are going to be striped. Sadly, we’re down to one fabric store here in Waco. Hancock Fabrics is going out of business, and their stock has been pretty well picked over at this point, and obviously they’re no longer offering special order decorator fabrics. That just leaves us with Joann Fabric. It might be time to make a day of it and head to Dallas. It’s just an hour-and-a-half away, and there are some great fabric stores up there. But at least I know now that there are fabrics available (and there’s always Spoonflower! 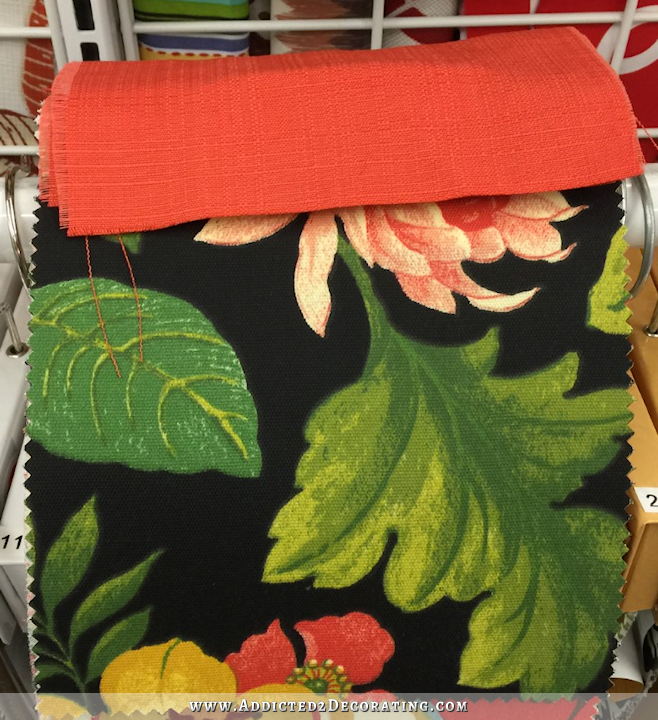 ), which means that I can go ahead and order the coral fabric for the chairs. I plan to tackle that project (six side chairs) right after I finish my draperies. Have you thought of making your own fabric? You did it with the painted wallpaper. Why not explore that avenue for your creative talents? Ooooh, I was thinking that as soon as she mentioned Spoonflower!!! Finding just the right fabric can be such a pain! Of the choices listed, my vote would be for the Richloom Studio Anamarie Aspen. I agree with Laurie. The Richloom fabric is beautiful. With all of the straight edges in the room, stripes, tile, etc., you need a softer appearance on the fabric. The colors are great and no need to worry about black. The darkest of the browns will read like black. In painting, there is no true black except what is manufactured. Third vote for the Annemarie Aspen. Colorful and cheerful but not veering into the old couch or too dark territory. I also think the Anamarie Aspen fabric is perfect for your room! The colors and style are just right and the light background works well with what you’ve got going on in there. Just lovely! Another vote for Anamarie Aspen. I love the mix of florals, stripes (your drapes) and other geometrics. Have you tried Hobby Lobby? They have fabric as well, and it looks like there’s one in Waco. 1200 Richland Dr Ste 1, Waco, TX 76710. 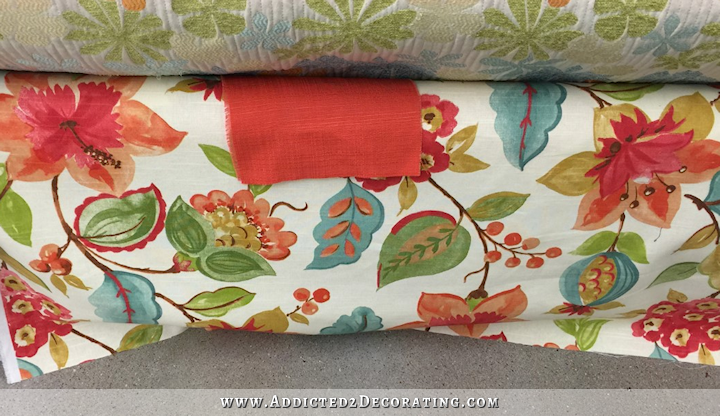 I always forget that they carry decorator fabric! I’m a Michael’s girl myself, so I rarely go to Hobby Lobby. So that store doesn’t even come to mind when I think about fabric. Good idea, though! 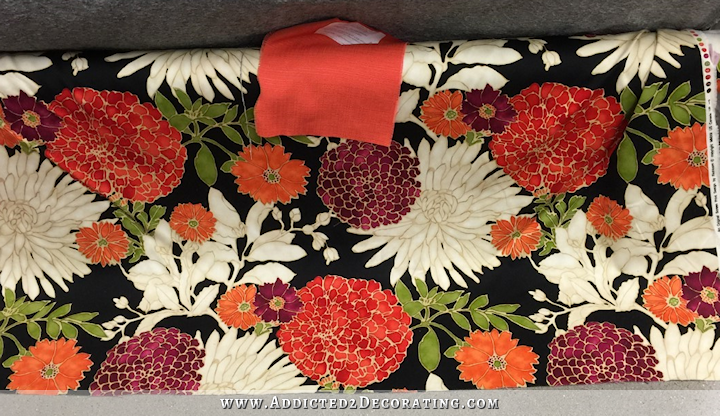 Perhaps add the black you want to the floral fabric you like. Maybe messy, sketchy style outlines? Or just go over the brown bits? Finding the right colors, pattern, oy!!! What I would do, (just thought of this) I would print out each of those pics enough to place over the chair area, and see what looks best in the room. Gah, so many florals… 1/2 of humans are MALES… why can’t they have some gender neutral fabrics? I don’t understand the concept of flowers everywhere for fabrics. If I was rich (had money, you need money to do anything these days) I would be a fabric/wallpaper designer. But with no money or contacts of the fabric world, I feel like I will stay a cleaner for the rest of my life. Roxanne, you CAN be a fabric designer – check out the Spoonflower.com website. You can design your own fabric, wallpaper, wrapping paper, and probably other things I’m not aware of. There may be a bit of a learning curve and possibly some special software you may have to download to do the designing, but why not check it out and see if it’s something you’d like to do? You could possibly market the designs on an Etsy site or your own blog. Who knows, your designs could become something! Have fun and good luck! Thank you so much Kimberley! Two great choices!! I hope Kristi sees them! Perfect. In my opinion anyway. LOL. The fabric hunt can be so frustrating. But I know you won’t settle and do the boring or slightly off thing. The Cliffside one looks too Jacobean and Tribal one too bold and, well, tribal for the room. I like your vision of a more watercolor like print, but the one you found while the best of the ones you’ve u showed us isn’t quite right. Happy shopping! Whatever you decide on will bebeautiful. Picking material that will compliment your beautiful mural and striped curtains is quite a task! Goid luck, i am anxious to see your choice! choices, choices, so many choices. Have you checked out Calico..have mail order..not sure if there is a store within driving distance where you live. We have a similar problem where I live where fabric stores are becoming a thing of the past. Not a happy camper! I will be looking forward to your selection with baited breath. I don’t really like any of the black ones. They just seem harsh to me. If I had to pick one, the Tropix Millbrook Onyx is my fave. I really like the two without black, the floral and the stripe. The chairs and table are black, is that right? If so, I don’t think you need more with the fabric. The multicolor stripe would be great in conjunction with the floral. I think it’s a more casual fun look on it’s own though…which I don’t associate with your style. Also, I discovered the possiblity of fabric shopping online from you…how come you’re not considering it here? Have you already looked or too concerned with the exact colors? P.P.S. Idea for a future DIY Basics post…share some of your favorite online sources! Many other of your Basics posts have been VERY helpful in my own projects. Thanks! The table is white trimmed in metallic gold. Beautiful. Florals aren’t gender neutral? Most famous gardeners and horticulturalists are men and many, many men design floral wallpaper and fabric. My husband, a heavy duty mechanic and manly man, likes floral fabrics. 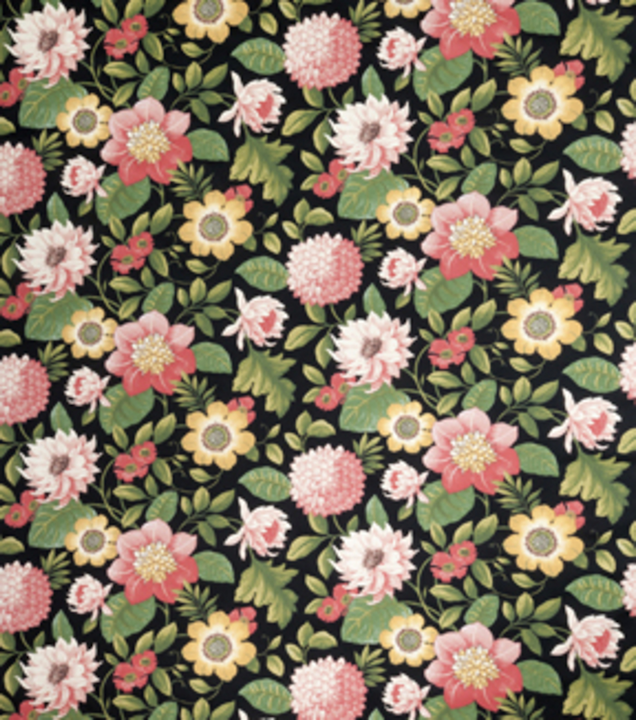 Anyways, I really love the Swavelle Mill Cliffside Noir fabric – too bad it won’t work – cause it’s to die for! This is a geometric. . .
That’s so cute! But It doesn’t really have any of the right green, just tealy green. In my monitor I see the tealy color but also the dark green. I’ve had positive results with Fabric.com; twice I’ve found the fabric with them but purchased via Amazon. It’s good that you’re finding some of your color combinations, but somehow I don’t think any of those are the one….they don’t seem ‘you’….except for the Richloom Studio Anamarie Aspen one. I think it’s a good idea for you to take a day off and drive to Dallas to look at fabrics……take your Mom and make it a girls day! I know when you find the ‘one’ it will be amazing. I’ll second that Sharon you read my mind. What do you think Kristi? I love the watercolor without any black. It is sharp and clear and clean looking. 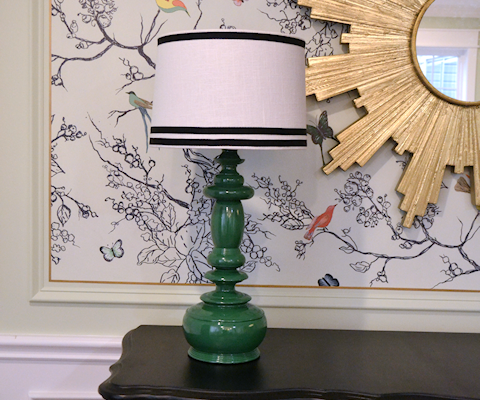 The stripe looks like an awning, the first one was not bad but you did not like it, the second one is awful with those big leaves, it belongs in a sunroom or on a plantation. The little flower from joanns is just awful. I do like the last black. Something about it appeals to me, however to keep the room light and bright go with the watercolor. I ADORE Taiunt Noir…..the first one………LOVE LOVE LOVE the black background….because you’re still doing the black and white drapes correct?….and I really really like the ….Venezia Cliffside Noir……..beautiful fabric….as well….love the background color….I think these two are fabulous!…..so anxious to see what you choose…..
Really like your favorite as well. Don’t think it has to have black in it, but only you can tell when it’s in your room. My favorite of these is the stripes honestly – it looks great with what you’ve got already. Plus I love the colors in it! This is my favorite so far! So pretty! I love that. That is beautiful!!! Wow – the St. Moritz isn’t a stunner – LOVE LOVE LOVE !!! I meant it IS a stunner !!! For dining chairs, I prefer darker colours, with colourful patterns. Spills do happen! Without hesitation I would choose “Swavelle Mill Creek Venezia Cliffside Noir”. 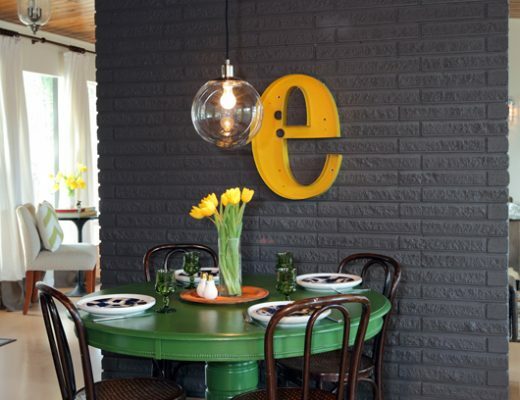 It suits the chairs, the room, and the whole house. I don’t find it “cutesy” at all. I think it would make the chairs more interesting. Too many plain colours (or rather, black/white) risk to give a boring tone to the room. And it reminds me of Turkish floral patterns. Glorious! All fabrics look great, though! Just a thought… it the table going to stay white (and gold)? 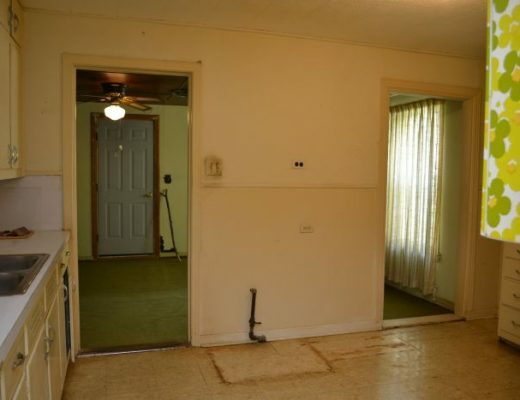 Buffet, chairs and door are now black…. I really liked the buffet when it was coral, with the round doors. I felt that, when entering the house, one could not have missed it, and then would start to pay attention to the decoration everywhere. My thoughts. Can’t wait you tell us your choice, Kristy! I’ll add another suggestion for my favorite fabric site… http://www.fabricguru.com has a large inventory and reasonable prices. I like all of the fabrics! This caught my eye… although it might be more bold than you are looking for. Here’s a stripe, but it may be too much coral and more than you want to spend. Don’t laugh at what I am about to say. I suggest going to Walmart, where they carry many Waverly fabrics along with coordinates. I fell upon the fabric for my bedspread and drapes there, and it was only $6.47/yard (I think)! I love my fabric. Saw this wall and thought of you (scroll down to March 28). By the way, the first time I ever ran across your blog was the spoon mirror you did, which I love. Have you ever checked fabric.com? I buy a lot there and you can order swatches before committing. Surely a city like Dallas has a “to the trade” wholesale fabric store. Take your business license and tax certificate with you. I live just outside Orlando and shop at a wholesale fabric store there that carries nothing but designer fabrics. They have literally thousands of samples that are a feast for the eyes. Hi Kristi! I’ve been an avid reader for years but have never commented (funny how that works). I actually work in a small fabric store in Ohio and immediately after I read this post, I searched the entire store for fabrics that could help you! I didn’t find anything- that’s a very unique (and beautiful) fabric combination- but I’m going to continue to look tomorrow. I’ll email over some photos if I find anything that could work! Good luck. I think the Sarah Richardson Kravet fabric line m8ght be right up your alley. And simply add coordinating coral or black piping to the chairs. Isn’t it fun making a selection until you end up with “fabric overload”. To throw one more source into the ring Sailrite Fabric.com has some great quality fabrics and the will also send samples. Originally for the sailing/boating trade they have expanded and also have great video tutorials. Check out http://www.sailrite.com/Covington-SD-Pop-Rocks-Persimmon-Fabric and the two on the following page that coordinate with it. End chairs could have two complimentary fabrics. Just sent for black outdoor canvas to make an awning for my chicken coop door! Don’t settle! Personally, I don’t see any of the materials pictured being right for the room or “you”! What about taking the bird paper your Mom designed and doing it on Spoonflower using the colors you need? This could be cute with some black welt trim. Out of the ones you’ve posted, I like the first two best. You could go a couple different directions with this. With the bird floral walls, I think you need either a very small pattern or a very large pattern for the chairs. 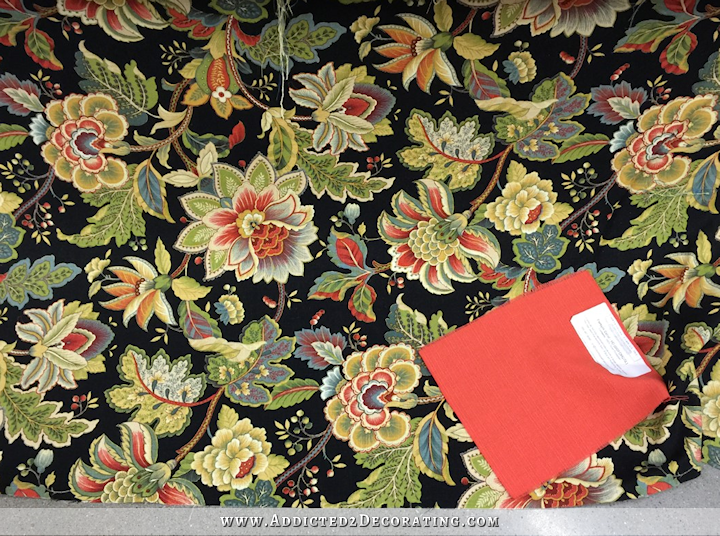 Of all the fabrics you showed in your post or others picked out, I liked the Annamarie Aspen. With the black and white drapes and the white wainscoting, the lighter, clearer colors on what I assume is a white background are best. I actually still like your original watercolor fabric because it’s floral pattern is abstract enough to not compete with the mural. I would be inclined to choose a pattern complementary in color to the mural but not competing with it in terms of theme. 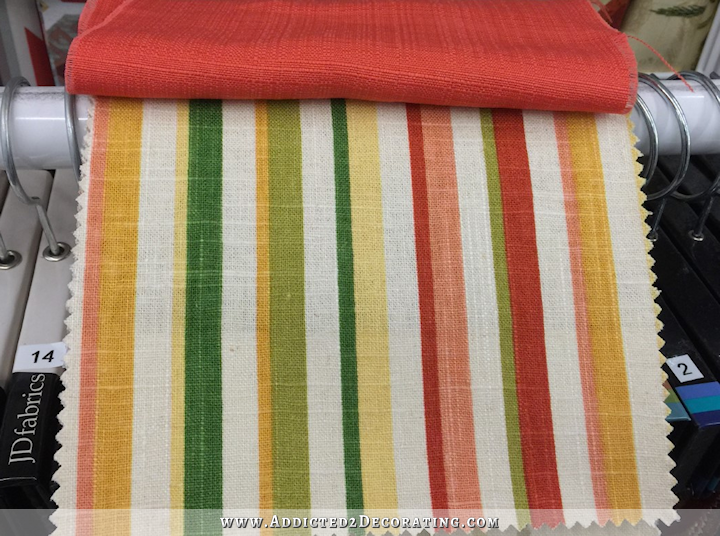 I realize this one is rather different from what you usually choose but think it could be a lighthearted but sophisticated choice, assuming the background color is correct when you see it in IRL: http://www.onlinefabricstore.net/robert-allen-at-home-neo-toile-coral-fabric-.htm. Just saw this on Joann.com.